Deome, here's a thought: Grow up, instead of acting like a spoiled 2 year old whining on the forums because someone made a better addon than you. Whining in guild chats, whining on forums, quitting guilds when an officer dares to recommend master merchant, making threats and now baseless "stealing code" accusations. This stealing code thing is just your latest tactic in month's worth of putting down Philgo's app since the day it came out. And then YOU accuse OTHERS of "bad-mouthing" you? That's cute. Considering how much you've stolen from Millus Roster and my own mods, I'm surprised that Millus doesn't have any credits on MM's page. - ppl reported an errors after every your update, you never answered. Last edited by QuadroTony : 03/28/15 at 12:48 AM. 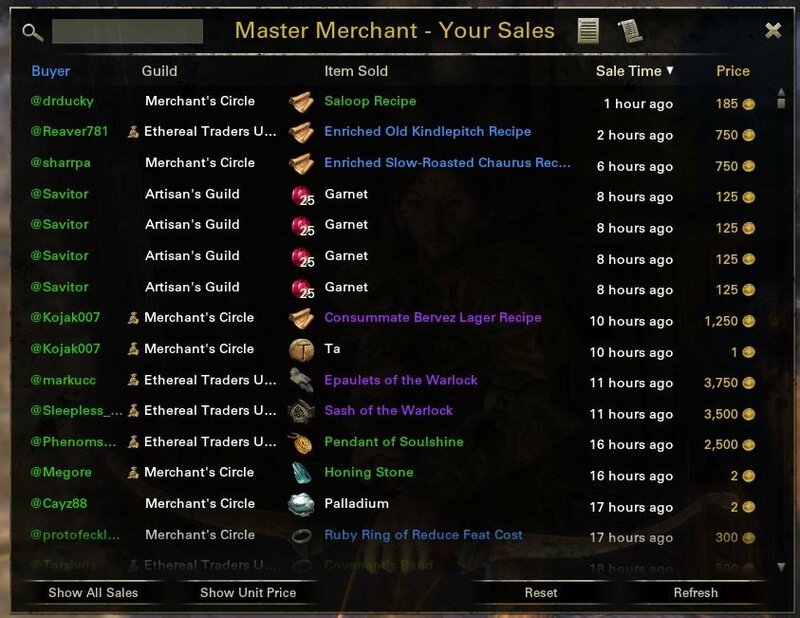 The Master Merchant page does indeed credit Millus for the small bit of Stat to Chat code I used from his addon, "Thanks to Mattmillus for some of the Stats to Chat code." I have no control over what other say or don't say about your addons, so please don't lay that at my feet. 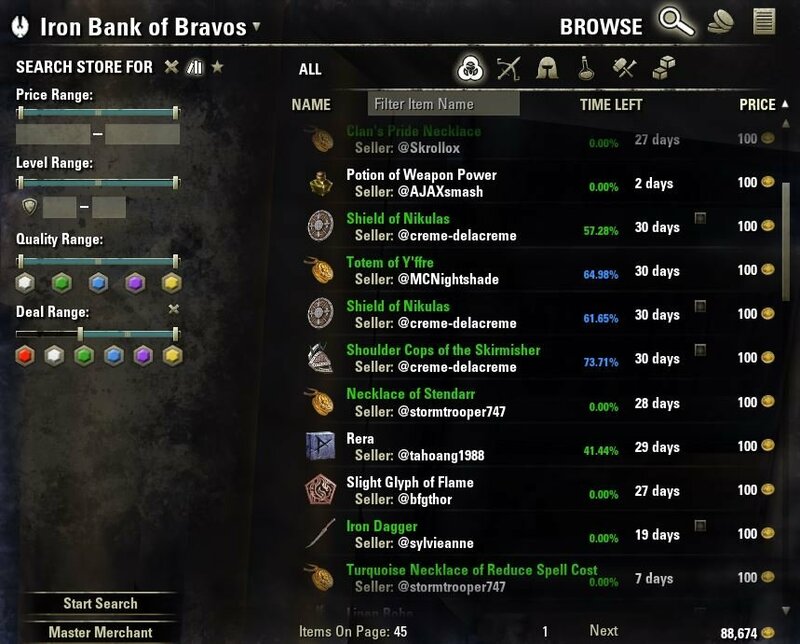 I can't say I've looked too deeply into the GuildLibHistory library, but it seems like it doesn't return information until it's brought all the guild history in from the server, while the scanning MM, and SK before it do, is as shallow as possible to return an offline sales report ASAP to the user on login. Finally taking this to these forums, and others, as I have tried to resolve the issue with both Cairenn and Philgo68 without success. 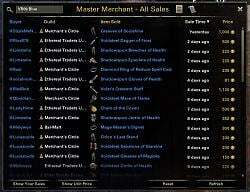 Philgo68's Master Merchant addon borrows a number of features originally published in DataDaedra. 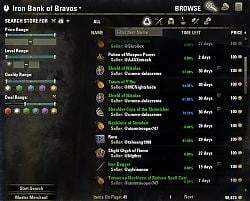 Philgo68 claims that he borrowed the code from Millus Roster, an unpublished addon my friend Millus wrote (in his own words, using a number of things from DD, with my blessing). I myself have used code from Millus Roster, with Millus's blessing, and inclusion of Millus's license as he requires. 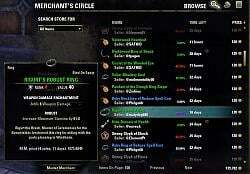 However, among the numerous people Philgo68 thanks on MM's page, neither I nor Millus are mentioned, and his Master Merchant addon does not include Millus's license nor my own (which are identical). 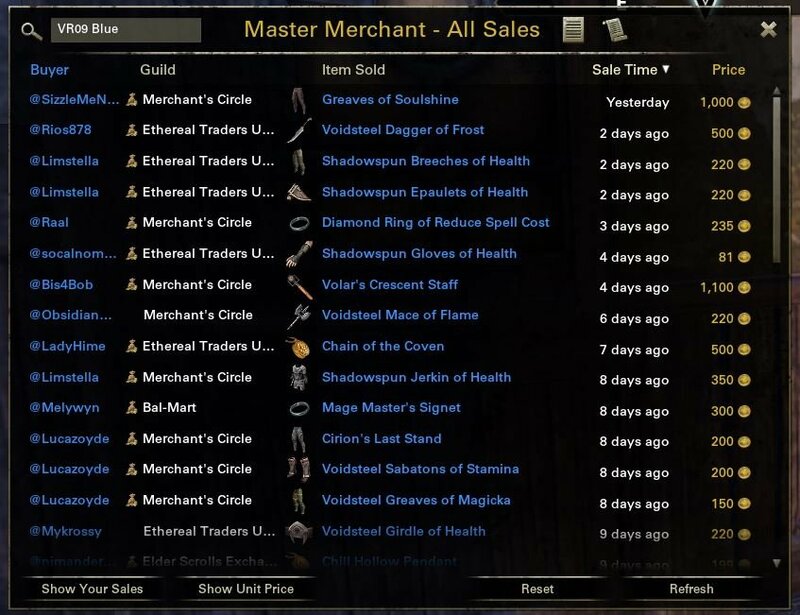 To add insult to injury, many of the people Philgo68 thanks on Master Merchant's page frequently disparage me, and my addons, in guild and public channels. 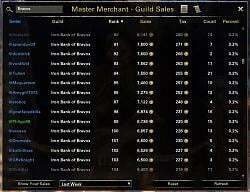 Those guilds promote Master Merchant, and either ignore or insult my own. 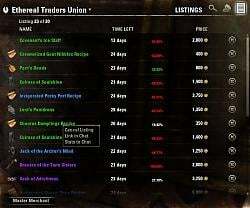 I have worked tirelessly over the past year on my addons, and I am absolutely fed up with hearing people state that Master Merchant is "better" because it includes my features--features that were further developed beyond Millus Roster and published long before Master Merchant was released--and that DataDaedra is "incompatible" with Master Merchant because Philgo68 doesn't know how to include our (Millus's and my) LibGuildHistory, which we wrote specifically to solve any issues of compatibility with history addons. Quite frankly, I do not believe Philgo68 could have been completely unaware that they were in DataDaedra. I'm further infuriated that Philgo68 refuses to credit either me OR Millus, nor use the license we share. I wouldn't be so irate had there been some acknowledgement of indebtedness on Philgo68's part in a timely fashion, nor if he wasn't thanking so many people who I've seen badmouthing me and my addons publicly. 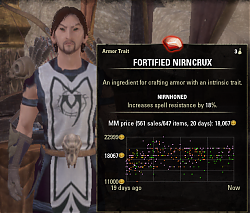 But now I want those borrowed features removed from Master Merchant, or Master Merchant removed from ESOUI altogether. Otherwise, what's he going to steal next so that people can say "Yeah, but MM has that too!"? "I am alive because that one is dead. I exist because I have the will to do so." 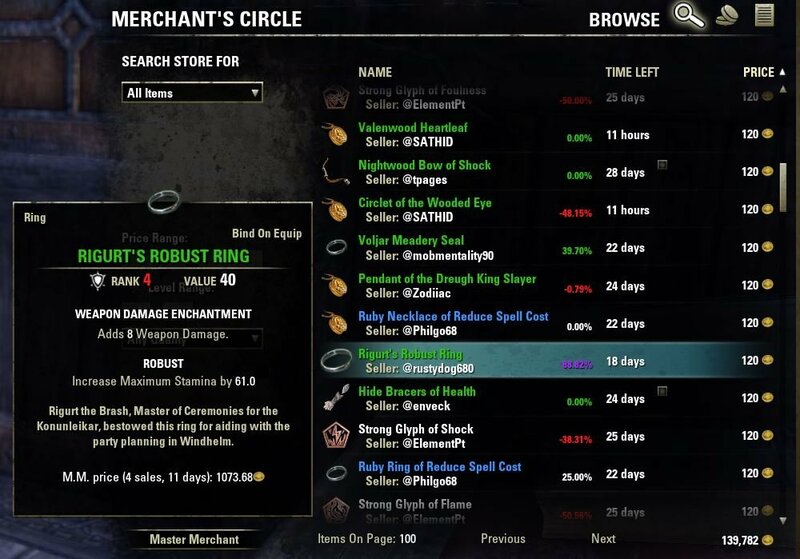 -- Now-last, "Boethiah's Proving"
this re-seller profit include auction fee for listing items too? The item has been seen 50 times, so it's in the high volume range. The margin %'s are correct 50%-ish in the one transaction and 77%-ish in the other. But it's the resales profit that makes the difference. If resold at market price, the 50 items purchaced for 5,500 would yield another 5500 in profit. The smaller purchase of 3 for 150 would yield only 510 in profit. If you look at the calculation logic I posted previously, a high volume purchase with a margin > 50% and a profit > 3000 is a Gold:deal = 5. The margin % for the other deal qualifies as a gold deal, the profit does not so it falls into the margin > 50 and profit > 500 line for a ranking of Purple:deal = 4. 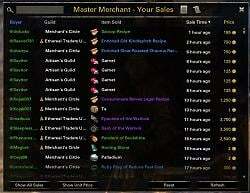 Sorry for newb question but with Master Merchant, I don't need Datadaedra? This will collect all sales automatically as well? Or do I have to scan when I am at merchant like the auction mods in WoW? I doubt there is enough cooperation to make it happen, but making DD and MM not scan at the same time would fix most of the problems. To get around this, I have DD set to only scan manually(deselect scan on login and scan on zone.) Then just set DD going once every now and then when MM is not scanning. Sounds like it might work, but I'd watch out for duplicates when you set DD to scan. Please let us know how this works out for you. I already do it. It works out great for me. The only time there is a problem is when DD and MM try to scan at the same time. DD and MM do similar things, and are not compatible with each other. 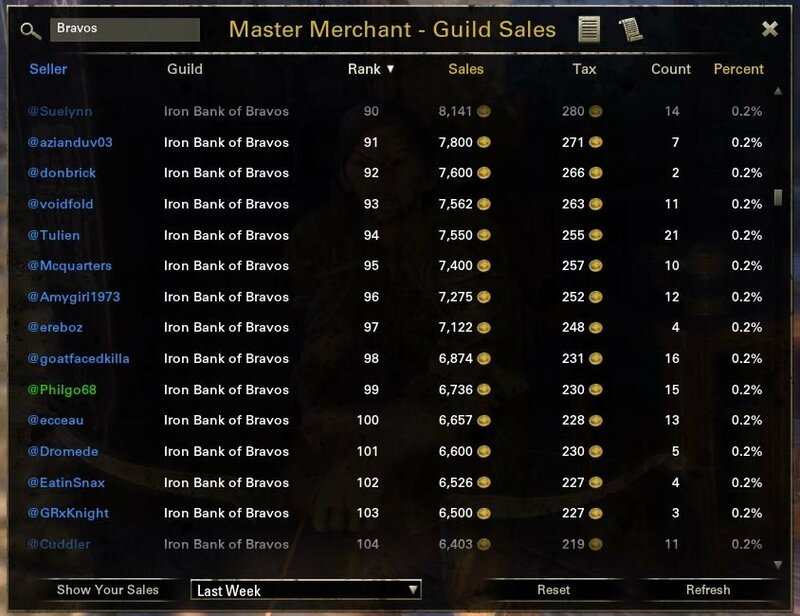 MM will automatically keep track of all the sales it can see in the guilds you belong to. That's what it uses to suggest pricing, the value people are actually paying for goods. 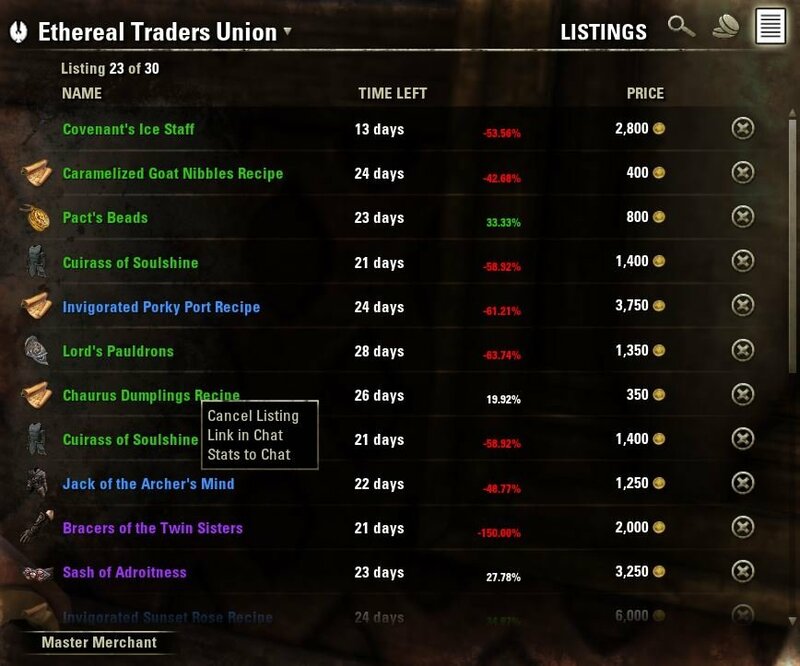 Personally, I also use Price Tracker Updated to look at guild listings as another source of pricing info. With that you do have to manually scan the store listings. Last edited by Philgo68 : 03/25/15 at 06:24 PM. 1. Confirmed, but I have no idea why. 1. More than 15 sales seen. 3. 5 or less sales seen.